On Friday, April 5th, Philip Rosedale stunned attendees at High Fildelity’s weekly General Assembly meeting (see the video here and embedded at the end of the article), when he announced that the company would no longer be sitting within the content creation / public space provisioning area with its platform, and that forthwith all public spaces hosted by the company, together with the large-scale events they have been hosting would cease as the company switches tracks to focus sole on software / platform development. The news was greeted with a sense of shock by High Fidelity users, and the company certainly moved very quickly to follow through on the announcement, shutting down all of the public spaces it has hosted, included social spaces and their flagship Avatar Island, which opened just over a year ago as a means of showcase virtual commerce, shopping and the power of the platform’s micro payments capabilities (see Commerce in High Fidelity, this blog, February 2018). One of the driving forces behind the decision is that High Fidelity is currently unable to gain major traction – and this despite major pushes to do so with some large-scale events pushed out to the media for promotion, and the former monthly stress tests of the system, trying to push concurrency rates up to determine just how well High Fidelity domains can handle multiple hundreds of avatars. Which is not to say all events are coming to an end: the platform’s popular bingo sessions are set to continue and – taking a leaf from Sansar’s book – High Fidelity is promoting coverage of the first operational launch of the SpaceX Falcon Heavy rocket with an in-world event on Thursday, April 11th. However, moving away from large-scale event hosting and hosting domains and environments to try to encourage user growth and instead turning to users and (I assume) suitable partners for audience-generating content, means the company will no longer be pulling against itself trying to both develop the software and platform and provide engaging content and events intended to acquire an audience and encourage their retention. Which, when you think about it, is pretty much what Linden Lab have, for the most part, been trying to do with Sansar. 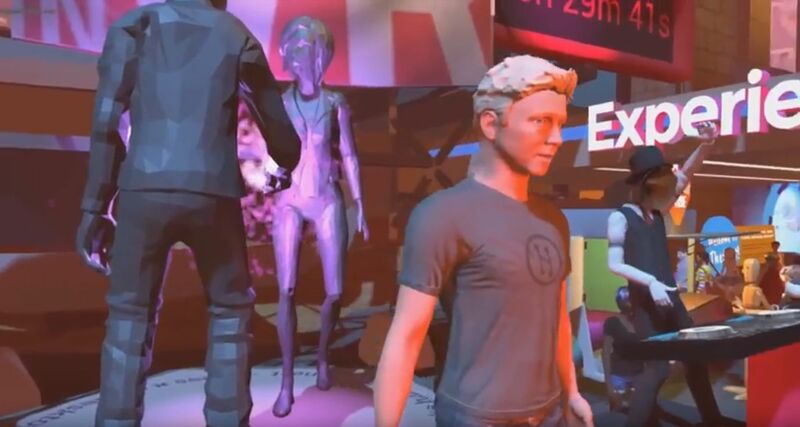 While the company have provided various social spaces, for the most part they have left content development to users, or have facilitated content creation on behalf of partner organisations (Intel, HTC, the Smithsonian, OpTic Gaming, Roddenberry Entertainment to name a handful) through Sansar Studios – and it has recently been indicated that we’ll be seeing more of this in the future. By shutting down our public servers, I actually make the prediction that there will be… more people concurrent across the servers that you guys run than us. So I’m not saying that we’re giving up on the servers, I’m saying that I want you to run them. Another aspect of the decision is the slow growth of VR in the broader public marketplace. In this, High Fidelity is possibly more vulnerable than other platforms, in that while it has a Desktop option, it has largely marketed itself as “the” VR virtual spaces company. All of their major event activities; for example, the monthly One Billion in VR events, the FutVRe Lands festival, etc. (bold emphasis my own), have all been VR-centric in their titles, potentially spurring a feeling among a broader audience that High Fidelity isn’t for them due to the lack of any personal HMD. Which is not so say others platform built to try to ride the wave of VR don’t also face issues building an audience. For example, much is made of the “success” of VRChat (which can be played both in VR and via desktop), yet the fact is, its average and peak hourly concurrency is only roughly one tenth that of Second Life. But, having said that, the take up is likely to come in time. In fact, as I’ve noted in other articles on VR, right now there are clear niche markets / environments where VR can have a significant impact – if someone can leverage them correctly: education; training / simulation; architecture / design / prototyping; healthcare; visualisation and computer modelling, etc. And in the future, as VR / AR (or more particularly MR / XR) do start to gain a broader consumer audience traction, then opportunities for broader virtual environments will arise. There is perhaps a broader take-way from the High Fidelity announcement: and that is, companies like High Fidelity, Linden Lab, Altspace VR, etc, are likely to face something of an uphill battle to gain an audience for their emerging platforms, even when VR does gain a firmer consumer foothold. The problem we have today is that that’s just not true. The internet affords us many, many, many, many different ways to be together as people, for example, or just to chat. And so one of the things we are up against here is that there is not as much of a genesis moment … Coming on-line you just don’t have the kind of meme in the sense of a grand or cultural meme kind of written out there like Second Life did. That doesn’t mean that we’re not going to make it. It simply means that we have to be more clever and the strategy that we use to get people in here has to be somewhat different. In other words, Second Life has been successful because, at the time of its birth and in the years of its initial growth, it was largely unique on all fronts in the way it captured people’s imaginations*, and its broadness of scope and its ability to embrace people’s imaginations and desires meant it could gather an audience to its shores long before anything came along to seriously challenge it. This is no longer the case. Today, the digital realms we have at our fingertips are limitless, be they for gaming, socialising, sharing, entire virtual environments, and so on. Whatever we might be seeking, the chances are there is already something there to sate appetites. Even creators can build and mod for a range of games and environments and – through the likes of Unity and Unreal and so on – build environments, all without necessarily getting too hung up on arcane tools built-in to platforms. Thus, and even if / when VR does become far more consumer mainstream, any attempt to build a world-girdling, audience-rich metaverse is going to face something of a challenge without a significant fiscal weight behind it. Not just in terms of developing the technology, but also into the marketing and PR and – most importantly – the licensing of content. To put this last point another way: were OASIS real, would all the models, characters, and so on from major franchises / brands seen within it really be user-built, or would they more likely be the result of hefty licensing deals that brings the content to the platform whilst protecting the rights (and royalties) of the licensors? But this is looking further down the road. Right now, High Fidelity’s decision is worth marking; how much of a wider impact it has is a matter yet to be seen. * Revised, from the original after Will Burns correctly reminded me Active Worlds predated SL. Some, but not all users at High Fidelity were shocked. There was even encouragement from some to go in this direction. High Fidelity just wasn’t very good at community management, but has created some impressive software. Users are coding and creating like crazy now; this was more of an incentive than any contest prize. Your article needs a correction though. The live streaming of the SpaceX Falcon Heavy was planned and hosted by the user Kenneth Rougeau, artist and owner of the domain Cinematheque. It is a popular spot, and you can even watch 3D video there when wearing a HMD. Thanks for the update on the SpaceX event location.